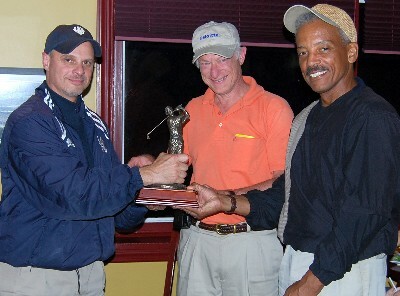 New Attitude CEO Tony Peters (right) and Karl Reuter (center) are presented the 1st annual Honorine Championship Trophy by tournament organizer Scott Gance (left). The pair tied for first place to win the 2009 Old Socks Golf Invitational. Their names will be engraved on the base of the Cup which they will keep until next year's event. "The tournament was enormous fun, but winning the trophy was a distinct honor," said Peters who wore for the occasion one of the popular convertible windshirts from his line of golf lifestyle wear. "Further, it's my second tournament win this year. Look out Tiger Woods!" adds Peters. The 2009 Old Socks Invitational was held September 11th at the Oak Hills Golf Club in Norwalk, Connecticut. Oak Hills is a lovely, yet compact and challenging public course offering narrow fairways, plenty of blind greens, elevated tee boxes, and water lurking everywhere to snare the unsuspecting. The Honorine Championship Trophy was named after Gance's mother, Marcelle Honorine Gance, to symbolize her passion for serving others. The work being done by Saint Jude's Children's Research Hospital to combat childhood cancer was especially important to her. Contributions supporting this vital work can be made at the Saint Jude's donation website: https://shop.stjude.org/GiftCatalog/express-donation.do?fnl=don_sin&plt=STJGENLKALSAC1000002. Click on the "Donate in Memory of Honor" tab on the left side. The Old Socks are a Wilton, Connecticut-based soccer team to which Peters, Reuter, and Gance all belong. New Attitude Sports International designs, manufactures, and distributes a unique line of golf lifestyle wear for both men and women. You can be a winner, too. Everything happens with a New Attitude. For further information visit us at www.new-attitude.com or call toll free (877) New Tude (639-8833).